Before we jump into today’s rather philosophical post, I have some news. First, I’ve had so much fun doing this series of music-themed posts that I want to do more planned out series, or thematic reviews covering multiple books, rather than rushing from review to review at break-neck pace. That being the case, I’m going to reduce my posting schedule to Monday-Wednesday-Friday in order to allow myself more time for planning. A list with links of all the books reviewed that month. I will note which ones are picture books and which are for older children. I will also be sending this out as a newsletter (I might also include notice in there of special events, such as book giveaways or contests), so if you want to receive it, please go here or email me directly at deborah (at) childrensbookroom (dot) com [obviously replace the words with the appropriate symbols] with any questions! If you have any questions, email me or post right here in the comments. The first review (and newsletter, if you want to get in on the game really early) will be going live this Wednesday and will probably cover rather more ground than we will normally do here since I’m playing catch-up. I’ll get creative with it, but next month will be more circumspect. I think music, being what it is, was one of the best media for exploring this topic. It’s a broad, beautiful topic, and, given the limited time, I shamefully left out far too many books: I grew up with Sing Me a Story, for example, but I didn’t bring up the opera at all in this series. I didn’t venture out of my preferred area of Classical music, and yet Candlewick recently published a fantastic book called Jazz Day, by Roxane Orgill, illustrated by Fracis Vallejo. I didn’t go into nursery rhymes at all, and yet what is more accessible music to children than “Ring Around a Rosy” or “Jack and Jill” or, if you want to make me shudder, “The Wheels on the Bus”? What I’m saying is that, as deeply as we went, as much breadth as we managed to cover, there’s so much more out there. Music is an endless topic, and so is its relationship to children’s literature. So I want to take a few minutes before we leave this series, to think about children and music and literature. I can’t think it’s just my Changeling who’s so deeply caught by music, or else why would there be so much published for children who love music? Why would it show up in so many books? Why would every daycare have circle time? Kids love music. People love music. We need music. I’m sitting in Israel writing this while a saxophonist is practicing next door. The other day it was a flutist (he was pretty good– playing Mozart). But we mostly have our children singing songs, not listening to instrumental music. This makes sense: they love to participate, and they can better participate in a song than in instrumental music at an early age. I’ve mentioned this before, but I’m a medievalist. Once upon a time, I can tell you, music wasn’t purely instrumental. Music accompanied poetry: lyric poetry was sung to music, and music accompanied words, both religious and secular. Then people started reading poetry as such, and music became instrumental to accompany dances, and then, gradually, instrumental music happened. It only makes sense if children follow a similar trajectory: first singing and participating in music and then listening with pleasure as they grow older. Except that the Changeling already likes reading about instrumental music in, for example, The Farewell Symphony, and she enjoys listening to music she hears about. Familiarity, I think, is the key there: she knows what’s available and accessible to her and enjoys it. But I think there’s something else. I hesitate to make grandiose statements, but is it possible that we’re underestimating our children a bit? 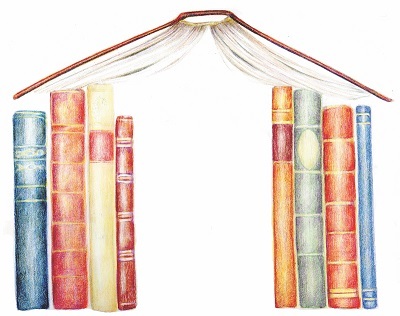 Not the books– the books I showed you are wonderful, or I wouldn’t have written about them. But aren’t our children (and I feel the need to tread lightly here) capable of more than my old nemesis Itsy Bitsy Spider? I hasten to add that I am not suggesting that we cut those little songs out: a) they equalize beautifully between different ages and levels of kids; b) the Changeling loves them, as do all her friends; c) they’re useful. What I’m wondering is whether we could add another level, whether at daycares or in our homes. Some listening time, rather than just singing. Maybe we could introduce some more complicated songs (oh, please, someone give me variety! ), maybe with more of a story. The Changeling loves some of the old Scotch songs I grew up with: “Speed Bonny Boat,” “Loch Lomond,” etc. Those are great fun to sing and have a bit of a story to tell. I suppose if I’m making an argument at all here it’s to say that looking at the depth and breadth of these books has made me think: if our kids are engaging with such a brilliant range of literature and enjoying it, maybe the musical side could see a little expansion as well?